The March 30 launch of a SpaceX Falcon 9 rocket with 10 Iridium satellites onboard. During the March 30 webcast of a Falcon 9 launch, video of the ascent was abruptly cut off at the nine minute mark, with SpaceX officials saying it did so to fall in line with government restrictions. Weird, right? What’s even weirder is that an obscure, decades-old law is now suddenly being enforced. So what gives? We’ve been able to watch webcasts of SpaceX launches for years, admiring the rockets’ POV as they roar through our planet’s upper atmosphere. Late last month, however, as the private space company was working to deliver 10 new Iridium satellites to low-Earth orbit, the video transmission suddenly went black. The National and Commercial Space Program Act requires a commercial remote sensing license for companies having the capacity to take an image of Earth while on orbit. Now that launch companies are putting video cameras on stage 2 rockets that reach an on-orbit status, all such launches will be held to the requirements of the law and its conditions. SpaceX applied and received a license from NOAA that included conditions on their capability to live-stream from space. Conditions on Earth imaging to protect national security are common to all licenses for launches with on-orbit capabilities. As noted, SpaceX has been broadcasting images from space for years without the benefit of a license, and without NOAA giving it a hard time. So what’s changed? 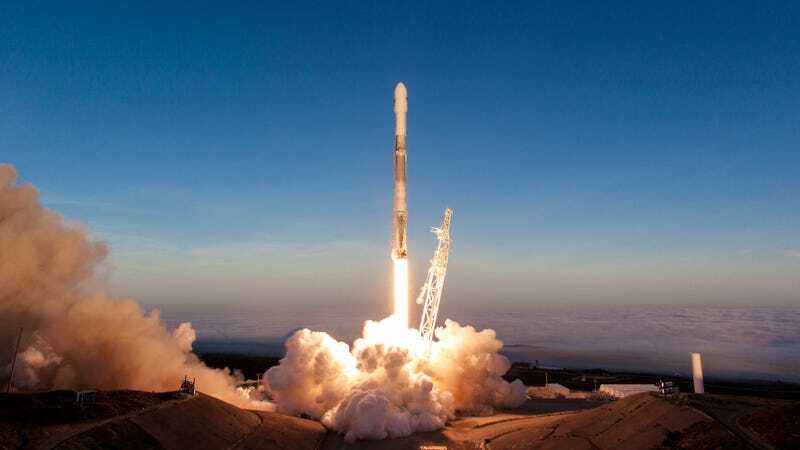 As reported in SpacePolicyOnline, Tahara Dawkins, director of NOAA’s Commercial Remote Sensing Regulatory Affairs office, SpaceX advised NOAA that it was unaware that licenses were required until it was contacted by NOAA. SpaceX quickly scrambled to apply for the application just four days before the Iridium launch. Normally, NOAA needs about 120 days to process such a request, so it’s no surprise SpaceX wasn’t granted the allowance given such short notice. When it processes a license request, NOAA has to check on any potential security risks posed by the launch. Which is actually really weird when you consider how poor the video quality is during liftoff, with the rocket and its smoke trail obscuring our view of Earth. Seriously, how much of a threat to national security could these videos actually pose? And which national security interest, exactly, is NOAA looking to protect? Gizmodo asked NOAA these exact questions, but we have not received a response as of this posting. If this story sounds odd, you’re not alone. The industry experts we spoke to said the situation is pretty messed up, blaming the episode on government bureaucracy and what they believe is now a pathetically outdated piece of legislation. The original reason for licensing, he says, was for national security reasons in an era, during the 1990s, when private entities were starting to do high-resolution imaging that could compete with spy satellites. Today, satellites are regulated and restricted by the NOAA (among other government institutions, depending on the purpose of the satellite), also via the National and Commercial Space Programs Act, to protect national security. Also, there are potential privacy reasons for restricting high-res imaging. Gunter Krebs, a physicist, spaceflight historian, and editor of Gunter’s Space Page, agrees with McDowell, saying, “This is part of the usual bureaucracy.” As to why it’s being enforced now, he can only speculate. “Apparently it was not enforced, although the law apparently, if taken literally, always required this, as it does not differentiate for images from orbit with the purpose of observing the Earth or just for engineering purposes,” Krebs told Gizmodo. Like others, Krebs suspects that the recent publicity afforded to SpaceX during the launch of the Tesla Roadster into space—which the company broadcast for hours without license—may have had something to do with it. At the same time, he doesn’t believe that security issues are involved, as rocket cameras are “hardly usable” for such purposes. Krebs speculates that someone at NOAA likely figured the regulations apply to rocket cameras. Ultimately, however, he believes the government agency is suddenly enforcing a law that’s no longer up to date. Krebs said that NOAA needs to deal with this situation, mostly because cameras on space vehicles are starting to become common. His hope is that the government will exempt launch providers from this sort of licensing. “However, bureaucracy is usually slow to adapt to new situations, so we have likely to experience one or another livestream outage due to license issues,” he said. As noted, Gizmodo reached out to NOAA for further comment. We’ll update this post should we hear back.